Today’s gift guide is all about BABY. Most of these pieces we have and love and would make a great gift for the holidays. So hopefully I can inspire some ideas for you. And can we talk about Otis’ little smirk in this first photo?!?! MELTING INTO THE FLOOR. 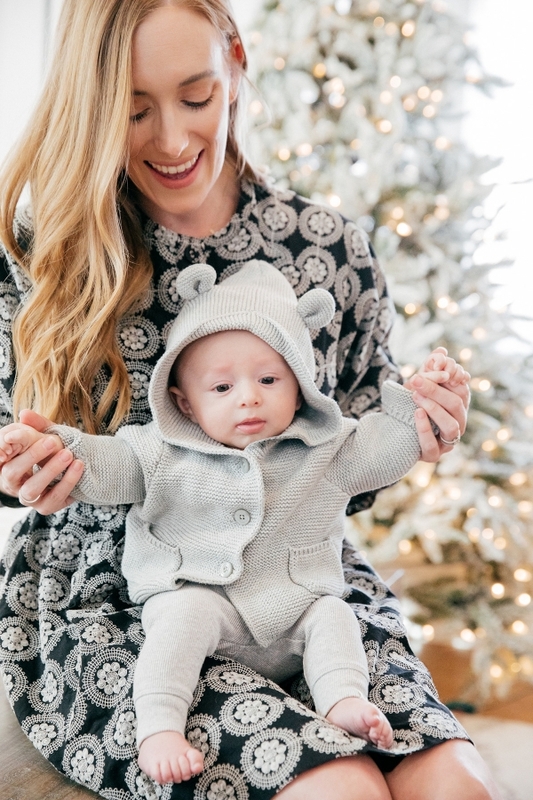 #1 // cozy pajamas: There is nothing like a super soft pair of cute pajamas and I have this pair for Otis from Quincy Mae. It’s a small business based out of San Diego of the most yummy organic cotton basics. I love their clothing so much. #2 // farmstand playmat: We have multiple playmats throughout our home. I am a sucker for baby activity toys. What I love about this one from skiphop is that is pretty soft and easily folds to bring from room to room. Also I am a sucker for the little stuffed fruits and veggies. #3 // favorite swaddle: If you are looking for a gift for a baby that loves a swaddle, this is my hands down favorite from Ollie. Otis is a little Houdini and breaks out of most swaddles but not this one. It’s on the pricey side but it’s worth every penny. #4 // wheel toy: The motion on this toy is a real show stopper. It also suctions to a surface. #5 // firefly toy: Our children’s physical therapist used this toy to help get Otis’ attention and have him track the toy. It makes some great sounds and the colors and patterns are super engaging. #6 // ring toy: This one makes a surprising clanky sound and it really gets Otis’ attention. It’s also nice and soft and can stick to most surfaces with suction. #7 // lovevery play gym: I recently started using this playmat and Otis loves it. My favorite part is the tummy time area where you can interchange flash cards in the slots to keep things fresh to keep babies attention. The kit also comes with a high contrast black and white ball that Otis seems to love as well. This one is gorgeous but a little bit harder for me to move room to room since the doorways in our home are smaller. It comes with a hefty price tag but based on how Otis is responding to it, it’s worth the price tag. Also, if you are looking for a more modern designed playmat, this one is for you. #8 // mini chair: A favorite gift that Otis received recently was this little mini chair from Pottery Barn Kids. Not only will he be able to grow into but it’s personalized with his name. Also, the slip cover is machine washable. Win, win! #9 // knit toys: The Little Market makes THE cutest knit toys. They are also ethically sourced and I love supporting their nonprofit founded by woman to empower woman artisans around the world. I bought some of their knit toys years ago and I can finally give them to Otis to enjoy. #10 // Good Night Philadelphia: The Good Night series of board books have been some of the first books we have been reading to Otis. He seems to really be taking in all the colors and patterns and I really adore that they have specialized books for different cities. It’s a fun little pieces of where we grew up to share with our little Oats. #11 // baby oxfords: Baby shoes seem a little pricey for a baby that isn’t walking but damn are baby shoes ADORABLE! They might be a little bit of a luxury but I have been craving to pick up some new little shoes for Otis. Freshly Picked are a great little slip on. #12 // plush llama: I don’t know what it is about this llama, but Otis is OBSESSED. He giggles and coos when he sees it so it’s on my must have gift list. I put it on his belly on the changing table and it’s a guaranteed smile in this house. docdivatraveller - Otis is so damn cute! I love the sofa!